Insoles for prévention and treatment. Provide relief avoiding the pressure and the impact of the heel and metatarsus. Corrective product for relieving heel pain and improving stability while redistributing pressure. AirFeet DIABETES - 2-3mm thin, Reversible & Flexible. Semi-rigid Polypro product features deep heel cup of 12mm, standard swirl EVA top covers of 1/8inch, MH Sky bottom cover having complete length of 1/16inch and intrinsic heel and forefoot posts. This product is equipped with softness that will allow you to run, walk or jog longer. It guarantee 30 day comfort as it is designed especially for people with flat feet, heel pain and knee pain. An orthopedic insole, or orthotic is placed within the shoe to correct the orientation of the arch of the foot. These devices are used to correct postural defects and imbalance, to compensate for flat feet, pes cavus or similar anomalies, or to relieve pressure-induced pain on certain parts of the sole. Posture correction also can reduce back pain. Different insole types are designed for pediatric or diabetic patients, as well as for flat feet, pes cavus or other disorders. 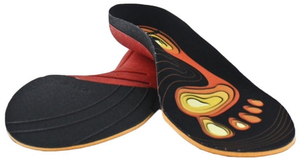 Some insoles have heel pads or arch supports to provide cushioning for specific areas of the foot. Such elements can be transverse or longitudinal. Certain models are three-quarter length. Choice will depend essentially on individual patient characteristics and comfort. Insole flexibility should be examined carefully.